Art Institute of Chicago, 1910. In 1910, two years after playing the male lead in the Girls’ Life Class production of Romeo and Juliet, my grand aunt Detty (Benita McGinnis) donned her period costume once more to become Hamlet, as seen here. The play attracted some media attention. The Chicago Historical Museum has a photograph of that 1910 production, taken by the Chicago Daily Tribune. 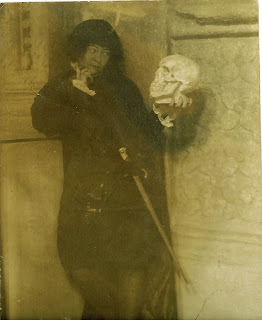 In that photo, Aunt Detty poses with Hamlet’s leading lady, Ophelia, played by Anita Parkhurst. Anita later became an artist in her own right and was one of the founders of the famed Algonquin Round Table. It is hard to decide which of these photos is my favorite. 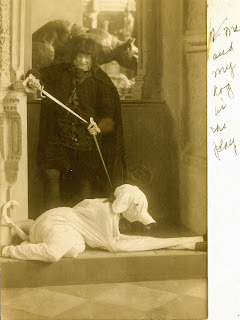 Though I like the one with the outlandish dog on the leash, I think I prefer the picture of Hamlet as he contemplates the skull of Yorick. I saw that expression many times. It usually meant that Aunt Detty was not so much contemplating something, as that she had some creative idea that no one had as yet devised. School of the Art Institute of Chicago, 1910.